87% of counterfeit cosmetics were sold illegally on authentic online marketplaces. 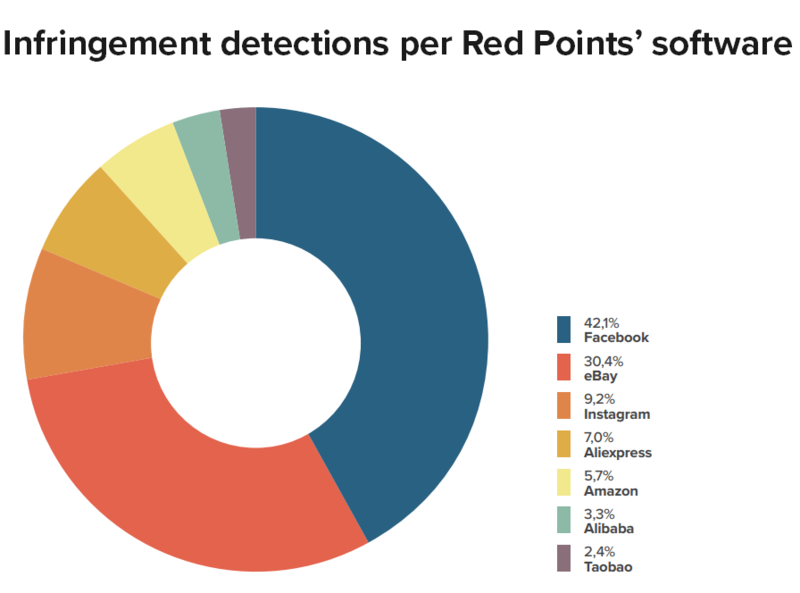 51% of detected cosmetics IP infringements came from Facebook or Instagram. Most consumers say brands have a responsibility to report and remove counterfeits. 15% of respondents became unconfident in their ability to spot a fake product after seeing comparison images. Research respondents who admitted to buying fake cosmetics products in the past overwhelmingly (87%) did so on conventional online marketplaces, either on eBay, Amazon, Alibaba or AliExpress or on Wish. Only 9% reported actually having bought a counterfeit from a social media page or app. So why is social media highlighted here? The above findings clash with data taken from Red Points’ proprietary software, which uses crawlers to scan the internet to find counterfeit products and intellectual property (IP) infringements in general. In fact, this data shows that the majority (51%) of IP infringements of cosmetics brands were found on either Facebook or Instagram. 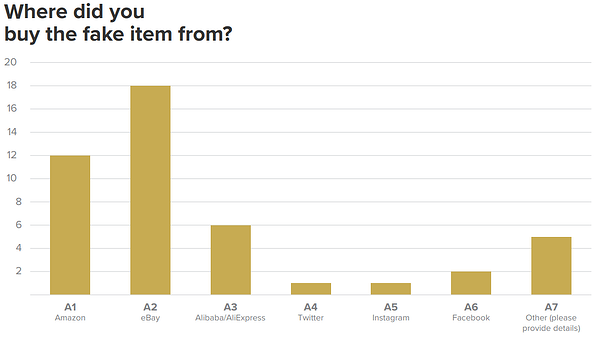 Otherwise, the two sets of data are more or less consistent, with eBay hosting the greatest number (30%) of counterfeit listings out of ecommerce platforms and Amazon, AliExpress and Alibaba also contributing strongly. Continued investigations produced interesting conclusions about this pattern. In reality, the huge amount of infringements found on social media aren’t posts to sell counterfeits, rather they are used to redirect the visitor away from the social media site to eBay, AliExpress or a different online store. This explains why so many IP infringements are found on Facebook and Instagram, but why so few respondents report actually buying a fake from there. This combination has quickly become a favorite for counterfeiters of not only cosmetics products but also of a whole range of other products. For example, Red Points saw detections of fake soccer jerseys quadruple in just two years, growing from 59,000 infringements in 2015 to 252,000 in 2017. Those selling counterfeits to the Chinese market take this further still. The first step is the same, by taking advantage of Instagram and Tik Tok to attract potential customers. However, China’s most popular messaging app, WeChat, allows sales to take place without even involving online marketplaces. Whether this trend spreads to Europe and North America remains to be seen. Counterfeiters are using social media, safe in the knowledge that many users on these platforms are happy to click on posts linking to products for sale. In fact, 44% of respondents have already purchased a cosmetics product via a social media post, and 70% would consider buying a cosmetics item from a 3rd party seller via social media. 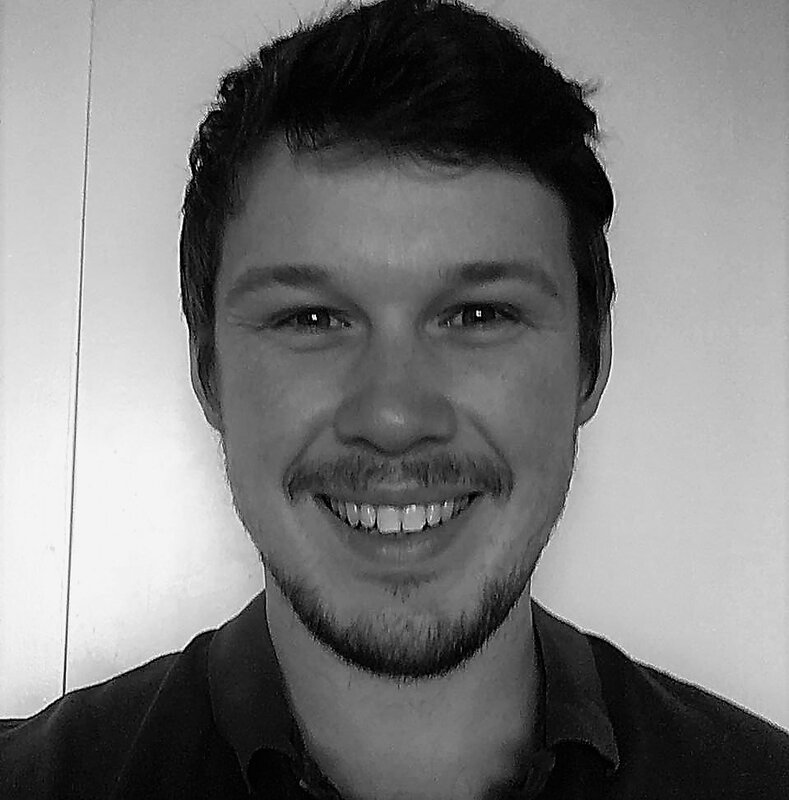 We’ve previously looked at the issue of counterfeiters using social media, and the dangers it poses to shoppers and brands alike. The method of evaluating the trustworthiness of a 3rd party product most commonly stated in the research was by using comments or reviews left by other users, followed by the product rating (e.g. star rating). The growing number of fake reviews and manipulated product ratings means these methods are becoming less and less useful as time goes on. It’s becoming easier for counterfeiters to alter these ratings inorganically, in order to fool customers into trusting them. 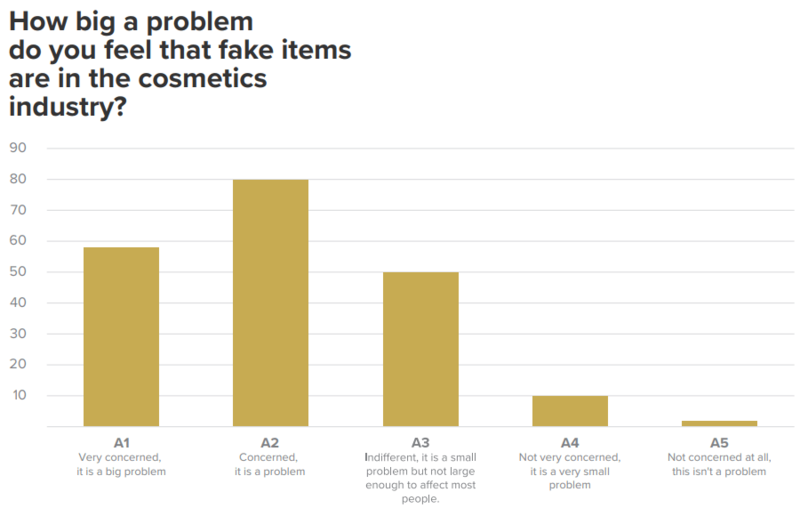 At this point, having given these initial judgments, respondents were then shown a series of images, comparing real and counterfeit versions of cosmetics products side by side. 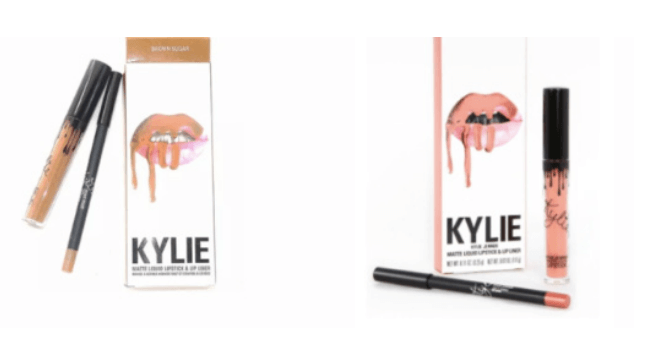 One example, comparing an authentic and counterfeit Kylie Cosmetics box, is shown below. 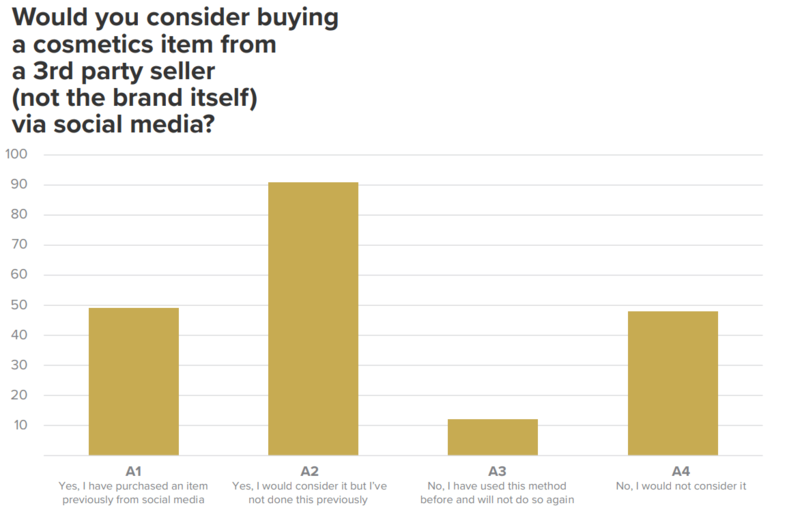 We can see that when shown actual images from authentic and counterfeit product listings online, respondents lost a great deal of confidence in their ability to tell which is real. Perhaps the perception of poorly-made knockoffs, full of spelling errors and poor design, lingers in the minds of many consumers, leading to them expecting to be able to spot a fake from a mile off. In reality, many counterfeiters have become masters of passing their fake products off as authentic online. If they can cause this much doubt of authenticity when the real and fake items are shown side by side, then tricking people into buying a fake when there isn’t a real product to compare it against is easier still. The research shows there is widespread concern about fake products in the cosmetics industry. 67% of respondents showed some level of concern, with 29% describing it as “a big problem”. In total, only 6% stated they were unconcerned about counterfeit beauty products. For fans of makeup, the risk of receiving a counterfeit comes with a real danger of physical harm. Illegally-made cosmetics products aren’t bound by industry regulations and don’t undergo safety checks before sale. Counterfeiters aren’t interested in making a safe, clean product that satisfies the consumer - they’re looking to create something which they can pass off as an authentic product, all while making it as cheaply as possible. Arsenic, which leads to health effects such as human developmental toxicity, reproductive issues, cancer, and poses an extreme danger to pregnant and breastfeeding women. Mercury, an extremely toxic metal which causes huge problems in fetal development and is readily absorbed by the skin. There have even been cases of the E. Coli bacteria, animal feces and urine, paint stripper and cyanide found, all of which can cause illness and painful rashes and reactions to the users’ skin. When these issues are understood, it’s clear that consumers’ concerns are completely justified, and that counterfeiting is a problem against which makeup consumers need protection. Whose responsibility is fighting fakes? We asked consumers whom they felt the responsibility of combating this problem fell to. 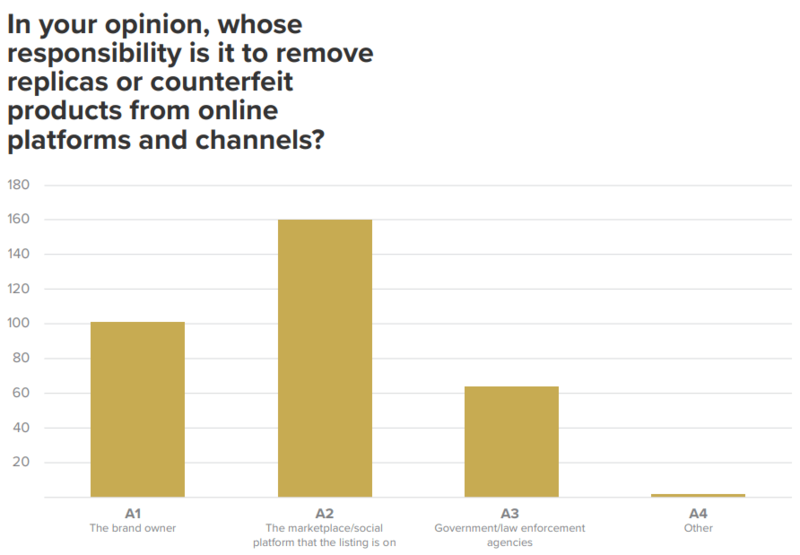 The most common answer (80%) was that the marketplaces and social media platforms are responsible for removing replicas and counterfeit products. However, while consumers may point the blame at these websites for the sale of fakes, court cases have asserted the contrary, including one that found that Amazon is not liable for the products sold by third parties on their platform. So, while Amazon, eBay, and other ecommerce platforms do still adhere to counterfeit takedown requests submitted by brands, the onus is not on them to keep their marketplaces clean. After platforms, the next most popular answer was for the brand owner to ensure that fake products are removed. 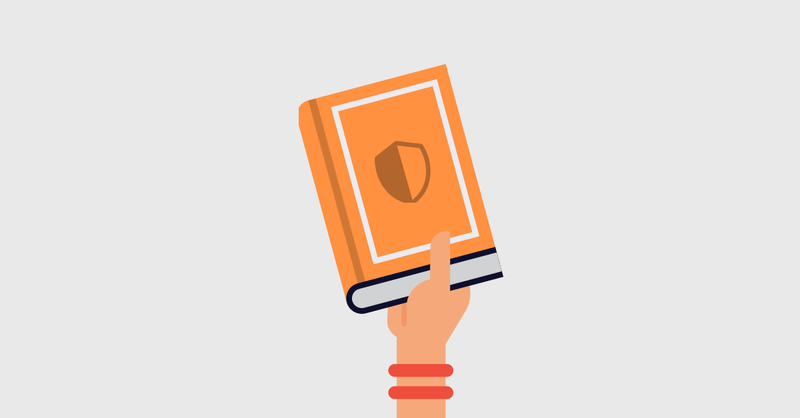 Even as the second choice, the majority of respondents (51%) believe brands have a responsibility to remove the products infringing on their own IP rights. Social media growing as a source for counterfeiters to promote and advertise their fakes. The staggering number of users on these platforms, coupled with privacy and anonymity features makes Facebook, Instagram and other social media sites irresistible for anyone selling fake products. These sites aren’t used in isolation, however. More traditional online marketplaces, like eBay, Amazon, and Alibaba, and even up-and-coming platforms like Wish have their use in the online counterfeiting industry as the platform on which the actual sale is made. Whether the EU and the USA follow China’s trend into selling products via messaging apps, like WeChat, remains to be seen. The growth of fake cosmetics sold online should come as no surprise. As we’ve seen above, people tend to partake in shopping behaviour that put them at risk of being tricked into buying fake cosmetics. Consumers overestimate their ability to spot fake products online, especially by judging them by the images in the product listings, and comments, reviews, and ratings are becoming less useful as a way of finding authentic products online. Finally, shoppers are urged by brand protection experts to not place their trust in social media ads. Consumers are concerned about fake cosmetics. Many have seen horror stories of people who have been fooled by counterfeits, or have bought them knowingly and simply thought that it was a cheap, but safe version of a real brand. Pictures of inflamed lips, rashes across the skin and other bodily harm caused by countefeit makeup are common. And shoppers are putting the responsibility of solving this problem on authentic brands.